Dr. Jorge Zamora-Quezada of Mission faces multiple federal charges in a $240 million health care fraud and international money laundering scheme. 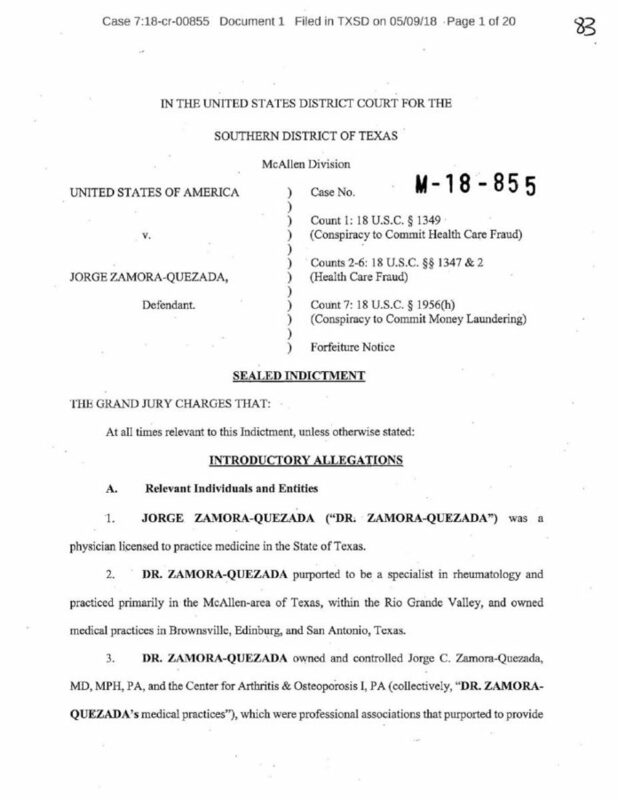 A physician with offices in Edinburg, Brownsville and San Antonio has been charged with multiple counts of health care fraud. Mission resident Jorge Zamora-Quezada, 61, was charged in a seven-count indictment for his role in a $240 million health care fraud and international money laundering scheme, according to a news release issued by the U.S. Attorney’s Office Monday. He faces one count of conspiracy to commit health care fraud, five counts of health care fraud, and one count of conspiracy to commit money laundering, according to to the indictment unsealed on Monday. Zamora-Quezada is alleged to have fraudulently billed Medicare and Medicaid for treatments based off of false diagnoses since 2000. He and his conspirators are charged with funneling money made from the scheme to bank accounts used to conduct further transactions in the United States and Mexico. They allegedly tried to conceal the source of those funds by investing in commercial and residential real estate throughout both countries. Among the properties were two luxury penthouse apartments in Puerto Vallarta, Mexico; a condominium in Aspen, Colorado; a condominium in San Diego, California; and one in Punta Mita, Mexico. They also purchased exotic cars and a private jet. Investigators also believe they laundered proceeds from the alleged scheme through a Casa de Cambio located in McAllen. The FBI is seeking to identify potential victims of Zamora-Quezada and his co-conspirators. Anyone who was a patient of Zamora-Quezada from January 2000 through May 2018 and believed to have been affected is urged to contact the FBI via the FBI victim’s hotline at (833) 432-4873, Option 8. They may contact the FBI via email at ZamoraPatient@fbi.gov.